Our mission – DO GOOD FOR THE WORLD – has always been a driving force for the company for over twenty years – long before being “green” became fashionable. All of our products and all of our decisions are pointed towards this ideal. We see this as a great challenge and a great opportunity. It all starts with INNOVATION, where we solve critical problems that require innovative thinking. Our tireless research and development efforts have led to numerous patents and a series of break-through products. Today we have thousands of chemical recyclers in markets across the world. Collectively these units are responsible for recovering 30 million litres of chemicals every year that otherwise would be discarded, saving our customers well over R1 billion and eliminating 75 million kilograms of greenhouse gases in the process. Onsite solvent recycling equipment first began to appear approximately 25 years ago. The idea of recycling was initially well received as it made both economic and environmental sense, however, the technology soon became discredited as it was inefficient, difficult to use, and unsafe for recovering flammable liquids. ChemChamp began developing recycling technologies in 1993. Our initial focus was to overcome the safety and efficiency problems that had plagued the industry to that point. In 1995 ChemChamp succeeded with the launch of the first solvent recycler that was approved to distil flammable liquids inside a production facility. The improved safety profile along with several other unique features established the ChemChamp technology as “Best in Class”. ChemChamp has not looked back since, continuing to press the boundaries of recycling technology. Our people are the foundation of our business. Doing good for the world starts at home. We all share a common commitment to our mission, to one another, and to our customers. This manifests itself most notably in our product quality and our level of customer service. 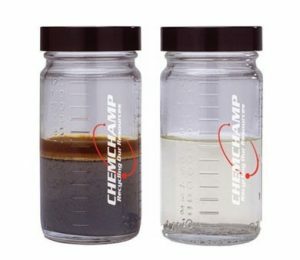 ChemChamp takes great pride in the quality of its products. Each product that is produced must go through rigorous testing and must meet strict guidelines. If there is ever any problem, ChemChamp is committed to resolving it to our customer’s complete satisfaction. We all count on one another and our customers can count on us. Changing the way chemicals and waste are managed. We provide a better, more efficient method for acquiring chemicals and managing waste. We use a patented distillation technology to transform your solvent/chemical waste into reusable, virgin-quality chemicals. Our revenues are based solely on the amount of solvent recovered, therefore our objectives are completely aligned with yours. Our goal is to provide: the highest yield possible, superior chemical quality, a seamless fit into your operations, and uninterrupted service. We take the risk, so you don’t have to.